These aliens appear similar to humans, the only differences being two prehensile probosci and a somewhat enlarged nose. People of their species are rare, but they have an impressive lifespan that can last for over a millennium. The proboscises lie coiled and hidden in pockets within the cheeks and can be extended to drain a victim's luck or soup by piercing the brain through the nose. The Anzati are capable of mild telepathic control to render their victims paralyzed, and are assassins of legendary skill. 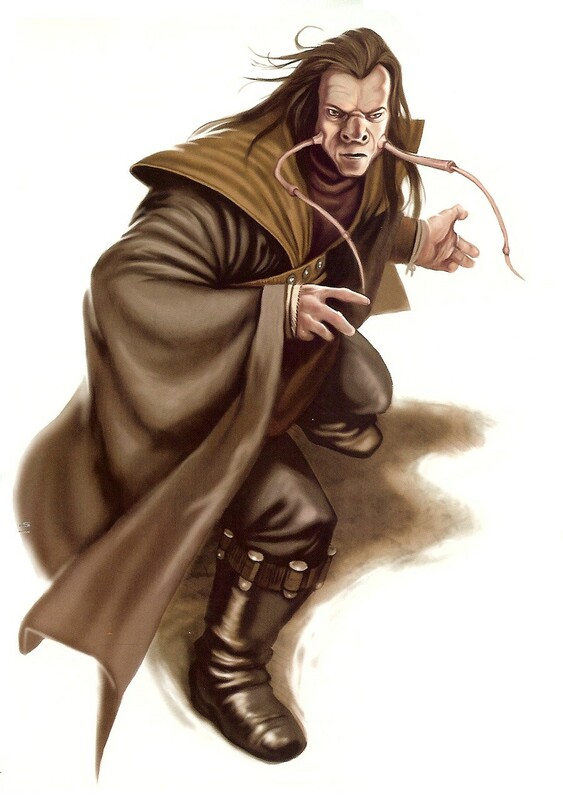 The Jedi hunting mercenary Aurra Sing was trained by these assassins, as was the Jedi Master Tholme. Their planet of origin has never been verified, as all sent to investigate the planet suspected to be Anzat are never seen again. Two more famous Anzati were Dannik Jerriko, a bounty hunter of great renown who took up residence in Jabba the Hutt's palace just before his death and the dark Jedi Nikkos Tyris.